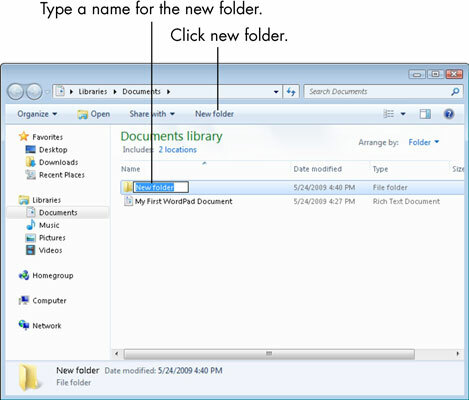 You can store documents on your computer inside folders. To create a new folder, start by going to the folder or library that you want your new folder to be part of. Don’t worry too much about creating folders as you start out. The folders Windows 7 provides may be all you ever need. As you accumulate more and more files, however, organizing them into folders may help you keep up with them. In the Documents library, for example, you might create a folder called Finances for files related to income, expenses, and investments, and another folder called Family for family-related documents. Which folders to create and how to name them depend entirely on your own sense of order. Click the New Folder button in the command bar. An icon for the new folder appears in the content area, with the name New folder next to it, already selected. Type the name you intend to give to the new folder. Don’t move the cursor or mouse before you start typing. Your new text will replace the highlighted text automatically. Press the Enter key to make the new name stick. You can open your new folder by double-clicking its icon.